Spinning reels are one of the most commonly used reels in the fishing world. A few of these reasons are they are often cheaper than Baitcasting reels, and there is a much shorter learning curve to becoming efficient at using them. A spinning reel is a fantastic tool on the water and matching it with the best fishing line for spinning reels can dramatically increase their performance. Traditionally, spinning reels are great for finesse fishing techniques, though advances in reel technology have made them much more efficient at high casting, fast retrieval techniques. While just about any type of fishing line that is currently on the market can be spooled onto your spinning reel, there are some factors that go into picking the correct line. In this article, we will take a look at the pros and cons of the three main types of fishing lines and how they pair with a spinning reel. We will also discuss some important features of fishing line that could be considered the best line for spinning reel applications and take a look at four products that we think match fit that criteria. Spiderwire is one of the most trusted braided line manufacturers on the market. There is a huge selection regarding the amount of line per spool as well as lb test. You also have several colors to choose from. This is an extremely strong braid that comes from the tightness of the weave as well as the high-quality Dyneema PE microfibers that are used for each strand. 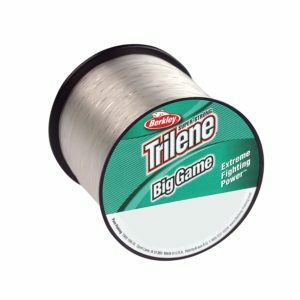 If you’re fishing in tight spaces and dense cover and have the need to rip lures and fish out without beaking line, this is an excellent option for fishing line. You are also going to be pleased with the coating technology used on this braided line. It helps reduce color fading as well as makes the line a bit slicker. This line can shoot out of your reel and through your guides with minimal friction and improves the lines casting performance. 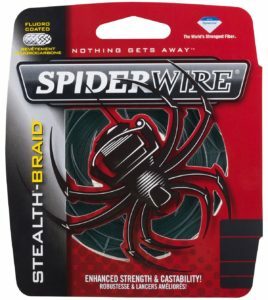 The biggest issue you will have on this Spiderwire line is that it has poor abrasion resistance. We have noticed fraying occurring just from tying a couple of knots where the line is rubbing against itself. It works fine in open water and around most vegetation, but when dragging through boulders or across rock bottoms, you might see a lot of fraying and subsequent weakening of the line. This is our second option for braided line, and we feel that it is one of the best braided fishing line for spinning reel options on the market. The reason for this is the small diameter of this braided line which ranges from .005-.035″ depending on the test strength of the line. While the line has such a small diameter, it does not lose the biggest attribute of braided line which is its strength. The small diameter also makes it much easier to cast with on a spinning reel. In fact, this is without a doubt, the best casting fishing line on our list. We also like how rounded this line is and think that it helps with the knot strength and knot versatility. We still recommend the more common braided line knots with this line, but you can tell a difference in knot strength with the Power Pro Spectra. This is a very sensitive line with no detectable stretch. In fact, it might be so sensitive that you have to be careful when finesse fishing with a spinning reel, as you can set the hook too early on fish that need some time to fully take the lure. You’ll have no problem reading bottom structures with this line as you get near full transference of energy from the lure, through the line to your rod tip. The excellent abrasion resistance also makes this a great line for finesses fishing in structured areas. This is a fantastic choice for the best monofilament fishing line for spinning reels. While there are a lot of monofilament lines on the market, and probably a lot of anglers who would crown some of these as the best mono fishing line for spinning reels, our choice has some important features that we think puts it above the rest. We love the amount of line you can buy in bulk with this monofilament from Berkley. It’s a tremendous amount of line for the price, and you are going to be able to spool a lot of reels without having to go back out and purchase more line. There are spools ranging from 8 to 60lb test, and they are also available in several different color options if you are looking for some line to better match water conditions. This bulk monofilament has excellent shock resistance which might be a huge plus for anglers needing a softer hook set. This line has a lot of stretch, even for monofilament which means that line in the water and seeing action will need to be replaced pretty often to reduce the risk of line breaks when trying to land a fish. This line also has very good abrasion resistance as well as decent environmental resistance to UV and water damage for a short period. The biggest issue with this line is the high line memory. If you’re fishing pretty consistently, it is not as big of an issue, but if the reel is sitting in the garage or boat for weeks at a time, you’re going to notice the line taking the shape of the spool which is going to hurt casting performance. This is a 100% fluorocarbon product and not just a fluorocarbon coating that is used on a lot of products. 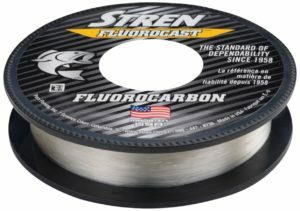 This gives Stren’s fluorocarbon fishing line more of the wanted qualities of this type of line, including the extremely low visibility in the water. Spinning reels are fantastic finesse fishing tools, with this fluorocarbon spooled or used as a leader, it is fantastic for use in cold, clear water. With regards to fluorocarbon products, this is easily the best line for spinning reel fishing. This is a dense fishing line that is going to have a high sink rate. We wouldn’t recommend using this line for lures you want to stay near the top of the water column or topwater, but if you want to get down, this is a great line option. This particular fluorocarbon line has excellent shock resistance giving you the ability to generate hard hook sets. It also has incredible knot strength which means those hard hook sets are less likely to cause line breaks at the knot. Another great feature of Stren Fluorocast Fluorocarbon is the low spool memory. We think it even rivals some of the high end braided lines in this respect. This greatly improves the lines casting performance. While this line is affordable enough to spool a whole reel with it, we have found that casting tends to drop off when used in this manner versus only using it as a leader material. The evenness of this line seems to vary, and when you spool an entire reel with the stuff, it often leads to pretty severe line twist. While we think it’s important for you to experience a large variety of fishing line and to learn for yourself which product is the best fishing line for spinning reel applications, we want to still help you out a bit and pick our favorite from the above list. 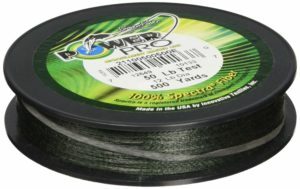 For our winner of this article over the best spinning reel line, we have decided to award the title to the Power Pro Spectra Fiber Braided Fishing Line. There are some braided lines that just don’t work very well with spinning reels, but this is not one of them. The small diameter of these line means you can spool a lot of braid onto a spinning reel. We think this makes it much easier to work with a spinning reel, especially in the casting department. The minimal spool memory also plays a role in its casting performance on a spinning reel. While it has a small diameter, the strength associated with braided line is still there. It’s extremely sensitive and features great abrasion resistance for a braided line. So not only does it get the honor of the best braided fishing line for spinning reel fishing, but it takes the cake in all categories. All of the four fishing line products that we have discussed are going to go great with your spinning rig and could easily earn the title of best line for spinning reels. There are tons of options for each product, and we are confident that you will be pleased with their performance on the water. Picking the right fishing line is a critical component to successful fishing, and we hope that this article has pointed you in the right direction. Line Type: There are three main types of lines that are used when fishing. Let’s first take a look at these three types of line and discuss their pros and cons and how they perform on a spinning reel. We will then take a look at some characteristics of what we feel the best fishing line for spinning reels should have. Monofilament: Monofilament is an extremely affordable fishing line that is much cheaper than the other two lines we will discuss. This alone makes it one of the more often choices for anglers. Monofilament has a lot of stretch to the line when compared to other line types. It’s nowhere near so much stretch to eliminate sensitivity to strikes, but it is less sensitive than fluorocarbon or braided line. Monofilament also tends to have pretty noticeable spool memory, meaning after being in a certain shape for an extended period or time, such as wrapped around a spool, will take that shape and can hurt casting performance and also impact retrieval movement. Fluorocarbon: Fluorocarbon is often used as leader material rather than to fill an entire spool. The reason this type of line is often used as leader material is because of its low visibility in the water because it has a similar refractive index as water. This property makes fluorocarbon line optimal for clear water where fish might be more wary of the line. Fluorocarbon has less line memory and less stretch than monofilament. It’s also important to understand when buying line if the line is 100% fluorocarbon or only fluorocarbon coated. If it is only a coating, the line will have more of a monofilament properties. Fluorocarbon is also a dense fishing line and is a great choice for deepwater fishing applications. Braid: Braided line is composed of several single strands of high molecular weight polyethylene that are then woven together very tightly and is what gives braided line its incredible strength. Unlike monofilament, braided line has minimal to zero stretch properties. This minimal stretch makes braided line extremely sensitive. It also means you have a lot less give on hook sets and it is easier to miss fish. If you need to pull big fish from tight spots or aquatic vegetation, braided line is an excellent choice. One of the major drawbacks to braid is that it will begin to fray, especially if used around rough structures. Over time, this fraying will cause the line to lose its strength, and you will begin to have a higher chance for line breaks. It’s easy to see the fraying and when it is substantial, simply remove the frayed portion of the line or re-spool. Another drawback to braided line is its visibility in the water. Braid is highly visible in the water and might not be the best choice for use in clear waters or line shy fish. Certain knots are also a problem with braided line. Braid is slicker than monofilament and fluorocarbon and using improper braid knots can lead to a lot of missed fish. Line Diameter: Line diameter affects several fishing properties. Larger diameter lines will increase the amount of friction between the line on the spool. More friction is going to reduce the amount of distance you can get on a cast. It mostly likely won’t be any drastic difference, but if you want that extra foot, it can come into play. With spinning reels, where the cast is carried out and eliminated by the lure, it’s important to have a smaller diameter line to get the most out of your spinning reel’s casting capacity. Line diameter can also impact how lures move in the water because of the water resistance it will generate. When fishing for wary fish, this water resistance might cause more disturbance in the water that will keep fish from coming in the last few inches to take the bait. Because of these two reasons, anglers often look for smaller diameter line that does not skimp out on strength. This is one major reason as to why braided line has gained much more popularity of the last several years. The smaller diameter will also allow you to spool more line. Line Color: A lot of lines available today, especially braided line has some options regarding line color. Fluorocarbon is often colorless since it would defeat the purpose of the line to be near invisible in the water. Braided line, and monofilament to some extent, are more visible in the water. 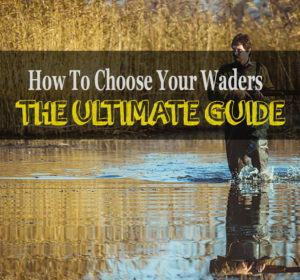 By coloring the line, you can help to camouflage the line to blend into water conditions or use vibrant colors to have a better idea of where your lure is in the water. Neutral colors such as olives and grays are good choices for most lakes where they can blend in with the water and natural vegetation. Highly visible colors such as reds and yellows allow you to easily tell where your lure is and how it is behaving in the water. Line Longevity: Regardless of the type of line you decide to spool onto your reel, eventually the line is going to begin breaking down and lose its strength. Braided line will begin to fray and dull while monofilament and fluorocarbon will eventually begin to breakdown from UV and water absorption. Be aware before you get into the water of how long you have had the line on and if it needs to be removed and spooled again. The best line for spinning reels are going to be able to function for several fishing trips with hard use before needing replaced. Line Twist: Line twist is inevitable with spinning reels and can lead to a lot of frustration while you are on the water. While the reel itself, plays a large role in line twist rates, the type of line can also impact the rate. Line twist is simply the line twisting on itself when being put back on the reel during retrieval. Monofilament and fluorocarbon show more line twist than braid simply because of their molecular structure. Well-manufactured line that is even throughout its length can greatly help reduce line twist and you will be able to tell the difference in line twist when using the best line for spinning reels fishing.